Oramo seems to be in perfect tune with these galvanizing scores, and he brings them to a splendid polish and pitch. Ondine complements his efforts with an acoustic whose breadth and presence are equivalent (...). Anyone who enjoys Korngold and the Hollywood school will respond immediately to this revelatory release. Not to be missed by any listener who loves the modern orchestra! A landmark issue. Musique d'atmosphère (...), multidimensionelle, intéressante, sensible, ignorante du Kalevala et volontairement hostile à Sibelius, que l'orchestre de la Radio finlandaise et son chef Sakari Oramo font revivre avec énergie et nuances, comme pour nous prouver (...) qu'il nous reste encore beaucoup de créateurs à découvrir avant d'oser écrire une histoire équitable de la musique occidentale. Sakari Oramo produces exemplary performances, faithfully recorded. One for the specialists. This CD is the first release devoted entirely to the work of the Russian-born Finnish composer Ernest Pingoud (1887-1942). Pingoud was of cosmopolitan background, having trained with Alexander Siloti, Nikolai Rimsky-Korsakov, and Alexander Glazunov in St Petersburg, as well as Hugo Riemann and Max Reger in Leipzig. 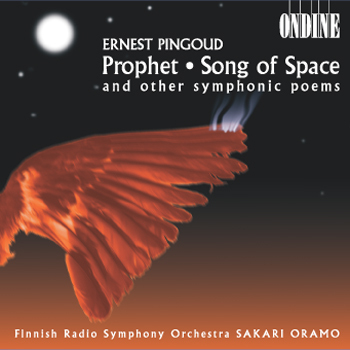 Pingoud drew considerable inspiration from symbolist art, especially for the composition of a dozen of symphonic poems, five of which have here been recorded by Sakari Oramo and the Finnish Radio Symphony Orchestra.